In this novel we meet the characters from "If Only It were True" once again. 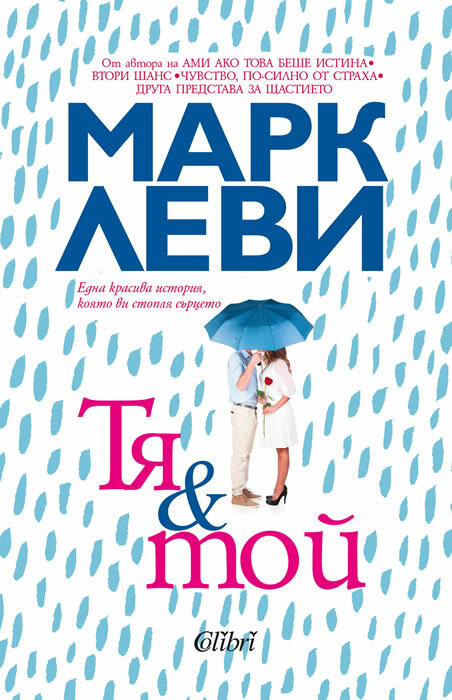 Marc Levy involves us in an irresistible and totally unpredictable love story. "She and He" marks the great return of the French writer to the comedy. Marc Levy was born in France on October 16th, 1961.When he turned eighteen, he joined the Red Cross, where he spent the next six years. In parallel, he studied management and computer programming at Paris-Dauphine University. In 1983, he created a computer graphics company based in France and the United States. Six years later, he lost majority control of the group and resigned. Starting again from scratch, he returned to Paris and co-founded an interior design and planning company with two friends; the company soon became one of the leading office architecture firms in France. At thirty-seven, Marc Levy wrote a story for the man that his son would grow up to be. In early 1999, his sister, a screenwriter (now a film director), encouraged him to send the manuscript to Editions Robert Laffont, who immediately decided to publish "If Only It Were True". Before it was published, Steven Spielberg acquired film rights to the novel. The movie, "Just like Heaven", produced by Steven Spielberg, starring Reese Witherspoon and Mark Ruffalo, was a #1 box office hit in America in 2005. After "If Only It Were True", Marc Levy began writing full-time. All of his novels have hit the top of the best-seller list in France. They are also very successful internationally and are consistently on the bestseller list in several countries including Germany, Italy, Spain, Russia, and Taiwan.